Drains clog, it's a fact of life. Sometimes that clog is simple and localized to one sink or a toilet. Other times, the clogged drain is more widespread, like the main sewer line in your home or business. Andrews Plumbing takes an escalating approach to unclog your drains and keep water from backing up into your home, basement, or business. Sometimes the clog is small and localized. Homeowners have been cleaning these clogged and slow drains for years with relatively inexpensive tools that get the job done. Other times, the cause of the clog can be tree roots, grease, old pipes and sewer lines, or things that should not have gone down the drain in the first place. In those cases, it's best to call in a plumber. Professional plumbers like Andrews Plumbing bring in heavy duty equipment like a power snake or auger to clear the drain, and keep waste water moving away from your home or business. Some homes benefit from a scheduled drain cleaning to keep waste water flowing and preventing an emergency call. Sewer trap clogged with tree roots can be cleaned with an auger or water jetting. Sometimes a slow or clogged drain will make strange sounds before water ever begins to back up. If you hear gurgling or bubbling coming from your drain, call us before it becomes an emergency situation! When clogs reappear and drains continue to drain slowly, we can snake a camera down your drain to see the problem in the exact location. The ability to see what is going on in your plumbing takes the guess work out of the solution and enables the right fix to keep your drains clear and running quickly. 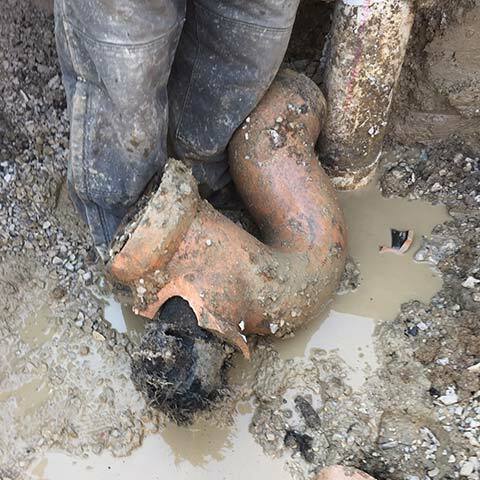 These cameras come in handy and save thousands of dollars in digging when big problems, such as collapsed sewer lines need repair. If your toilet clogs or you find your tub or sink running slowly, give us a call. Many times the solution can be found with simple drain 'snaking'. If that does not clear up the problem, we can run a camera through your plumbing to see what is happening. When we take a look we can say with great certainty that you have a big problem or a small problem. It's best to know what you're dealing with and to repair what is truly needed rather than guessing about the water and waste flow through your home or business. The toughest of clogs cannot win against Hot Water Jetting. Andrews Plumbing is the only plumber in Northeast Indiana that offers this service. Grease, extensive tree roots, and scale are quickly cleared and your pipes are as close to new as they will ever be.